Photographs copyright Thembisa Kennel , used by permission. "The dogs are big. They are more than two sawk tall (one sawk is a traditional measurement which equals the length from an adultʼs elbow to his finger tips). They appear in a variety of colors. And each dog has a ridge on the back. They are fierce. They are loyal to their masters. They are able to feed themselves, digging the earth in search of small prey. They like to follow their owner, to hunt in the wood. When they catch an animal they will bring it to their master. They are loyal to the entire household. They love their companionship. They go everywhere with their masters, even as far as the big yang tree. They are powerful and fearless.... Their ears are pointed erect and their tails stand like the swords of tribesmen..."
Dingoes began and evolved in Asia. 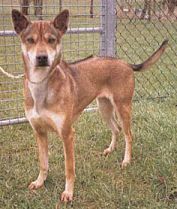 The earliest known dingo-like fossils are from Ban Chiang in north-east Thailand (dated at 5,500 years BP) and from north Vietnam (5,000 years BP). According to skull morphology, these fossils occupy a place between Asian wolves (prime candidates were the pale footed (or Indian) wolf Canis lupis pallipes and the Arabian wolf Canis lupis araba) and modern dingoes in Australia and Thailand. The Thai site at Ban Chiang is one of the earliest known sites that indicates that people changed their nomadic hunter-gatherer lifestyle to a sedentary and agricultural subsistence. This sedentary life allowed communal relationships between wild animals and people. The start of domestication of wolves into dingoes and other dogs began, fossils show, between 6,000 and 10,000 years ago. Dingo evolution in western Asia diverged sharply from dingo evolution in eastern Asia. The earliest records of the domestication of wolves from Israel to domestic dogs (e.g. Canis familaris poutiani, Canisfamiliaris, matrisoptimae) suggests that these early primitive canines were subjected to intense artificial selection by mankind from the very beginning. Cave paintings, etchings and frescoes in tombs, pyramids and middens suggest that the major reasons for selective breeding were to improve the characteristics of "dogs" for hunting, herding, hauling , guarding, scavenging and fighting. The ultimate outcome of the many mechanisms of domestication is the immense range of sizes, shapes, colors and temperaments found in modern breeds of dogs. What is often forgotten is that this doggie plethora of about 600 true breeding types was derived from a single uniformly structured canine, the dingo, via founder effects, selective breeding and genetic drift. The evolution of early canines in eastern Asia contrasts starkly with the events in western Asia. Although human societies in east Asia acquired the early canines for food, hunting, alerting and perhaps other cultural reasons, it seems they were never subjected to selective breeding or other artificial selection pressures. Morphological comparisons between the skulls of the early canines (dated 5,500 years BP) modern dingoes from Thailand and Australia and modern dingo-like domestic dogs show a great similarity between the dingoes and early canines but a clear cut difference between them and domestic dogs. The dogs, although closely resembling dingoes in size and conformation, are distinct. It is to this group of pariah dogs that the Thai Ridgeback belongs. The evolution of the Thai Ridgeback from the pariah dog cannot be precisely determined. The place of origin cannot be precisely located since the breed habitat is not only Thailand but also Vietnam, Kamphuchea (Cambodia) and Indonesia. The breed is only found on the islands of Vietnam (including Phu Quoc), Kamphuchea and Indonesia, however, while it is found on both the islands and mainland of Thailand. Phu Quoc, an island in the Gulf of Siam, was where the western dog fanciers first encountered the breed and obtained the dog in the 19th century when the island was colonized. A study was undertaken, according to Dr. S. Wannakrairoj to locate the place where the breed first appeared. To determine the place of origin without any historical record the genetic analysis of the Ridgeback was performed using reported survey data. The width of the ridge and the number of crowns on the body which are controlled by the number of additive alleles were used since the dog with the higher number of mutant alleles has the longer history. According to genetic theory the dog with the broader ridge or more crowns results from the accumulation of more (recessive) ridge genes. The Thai Ridgeback in Thailand has a ridge much wider than its back, sometimes down its flank, with a maximum of 14 crowns. The closest competitor from Vietnam, including Phu Quoc Island, has a ridge only on its back, not down the flank and a maximum of 10 crowns. Thus the Thai dog must have evolved for the longest period. Hence, the Ridgeback must be of Thailand origin. This justifies the name Thai Ridgeback. The areas with the highest population of the breed were the eastern areas of Thailand and particularly the eastern fishing ports. Thus it was probably Thai fisherman that took the dogs to the islands of Thailandʼs neighbors. Whether east Asian explorers took the dog to eastern Africa cannot be known. However it is clear that the Phu Quoc dog is simply the same breed as the Thai Ridgeback but named after the place it was first sighted by Western dog fanciers rather than its place of origin. Its current size, considerably smaller than the Thai Ridgeback is a commentary on its meager environment on Phu Quoc Island. The present bloodlines were collected by Thai fanciers over the past few decades. The breed was first recognized by the Dog Association of Thailand, then the Japanese Kennel Club, and the Asian Kennel Union and finally, as breed number 338 by the FCI in 1993. The TRD is now recorded with the AKC-FSS and registered through A.T.R.A. - the American Thailand Ridgeback Association. For more recent history on the Thai Ridgeback Dog, be sure to read TRD History .